This is a really interesting personal story told by one of our customers about how their AMCO monitored alarm saved their life. It's such a gripping and interesting story that we decided to make a video series of it based around a series of interviews we did with Mr A (which we'll call him for anonymity sake) at his home in Preston - which we saved from burning down whilst Mr. A was suffering from a hypo-glycemic attack (due to his diabetes). This is a great little story about how an AMCO alarm led to the arrest of a burglar who had broken into a betting shop in Walsall (Midlands). Due to the immediate audio-response monitoring, AMCO's monitoring station alerted the police immediately as the alarm was activated and the police responded within 5 minutes - leading to the arrest of the burglar and zero loss to the betting shop. 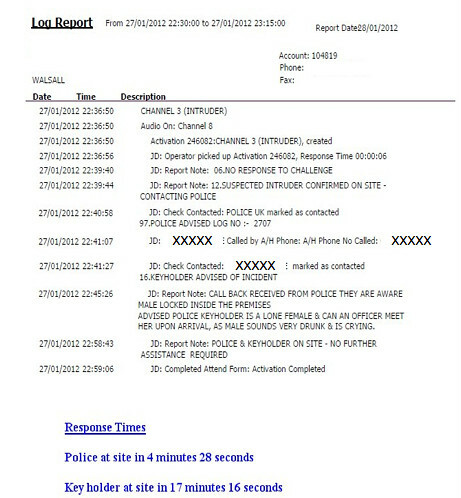 To get a sense as to how the police responded to the monitored burglar alarm, view the monitoring station report below - which show's how the police responded to the alarm within 5 minutes!